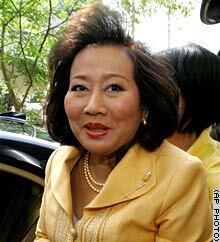 Pojaman Shinawatra, the wife of deposed Prime Minister Thaksin Shinawatra, was charged with evading millions of dollars in taxes, in a corruption case that could land Thailand's former first lady behind bars. If the Bangkok Criminal Court accepts the case, it would be the first prosecution of those close to Thaksin. Pojaman's brother, Bhanapot Damapong, and her secretary also face charges in the case, which centers on a 1997 transfer of shares in Shin Corp. An investigation by the Assets Examination Committee last month found that Thaksin's wife and her brother had to pay back taxes of about 546 million baht on the share transfer. Pojaman and her brother face a maximum penalty of 14 years in prison and a 400,000 baht fine each if convicted on two tax evasion counts.